Rangers director Dave King is urging creditors to reject Charles Green's company voluntary arrangement. South Africa-based King has also called on the club's supporters not to renew their season tickets until Green's consortium details its plans. "I am opposing the CVA and urge all loyal fans to do the same," said the exiled Scot. Green described King's statement as "breathtaking in its arrogance" and "destructive" to the club's interests. 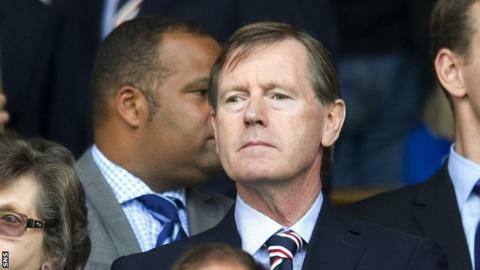 King, Rangers' second largest shareholder, had warned fans that "we don't want to be back in a similar situation next season" and hoped that creditors would refuse to accept the terms of the CVA when they meet on 14 June. He said: "I believe that all true Rangers fans should not buy any season tickets until full and frank disclosure has been provided by Duff & Phelps, Mr Green, and [owner] Mr [Craig] Whyte, as to what is truly going on behind the scenes." King argues that the CVA should be rejected because neither administrators Duff & Phelps nor Green's consortium has provided enough information about how it would fund the acquisition of the club or invest in it in the future. Nor, he claims, does the consortium's £8.5m offer give him comfort that it has the "requisite business skills", appreciates that "the club cannot be run on purely business principles" or recognises "that the fans are key stakeholders in the club". King also asserts that "it is clear from the CVA proposal that Mr Green intends to repeat Mr Whyte's strategy of using season ticket sales to fund the club. This would put fans back in the position of funding the club without owning it". But in a response to King's comments, Green said his consortium had already paid "substantial sums" to the administrators and described the season ticket funding claims as "scurrilous and scaremongering". "Provision has been made for working capital that does not rely on season ticket sales any more than would be part of normal operations at the club," said the Yorkshireman. "I would question Mr King's motives in urging the rejection of the CVA proposal which is the best offer available to creditors. "If the CVA is rejected then the club will be acquired on a newco basis which will not benefit creditors, nor will it benefit the club in terms of participation in Europe. "In one week's time, we hope the CVA proposal will be approved by creditors and that will be an important milestone for the rebuilding of the club." King says he has informed Duff & Phelps that he is claiming from the club £20m in damages - the value of his initial investment in Rangers - "based on the deliberate non-disclosure by David Murray of transactions that he had committed to on behalf of the club that were both risky and to the sole advantage of the Murray Group". He says the firm has ignored his representations, a charge denied by administrator Paul Clark. In a statement released on Thursday evening, Clark called King's remarks "disappointing and misleading" and said his claim against the club "contains a number of broad and unsupported allegations concerning matters which took place some ten years ago". "If Mr King feels he has a claim against Mr Whyte or Mr Murray, then that is a matter for him and not a concern of the administrators," added Clark. "The CVA proposal is completely transparent and gives detailed information as to different outcomes such as a newco or dissolution of the company. "It is a comprehensive document and there have been no issues raised about its content by significant stakeholders and creditors." King also states that, should the matter come to court, he will garner support from fellow "aggrieved investors" to seek reparation. He claims he would reinvest the cash back into the club. Duff & Phelps published revised and approved proposals to creditors on Thursday. Among the revised proposals was that HMRC would nominate Malcolm Cohen and James Bernard Stephen of BDO as joint liquidators, rather than Duff & Phelps, if the club was to be wound up. Meanwhile, Whyte, who has agreed to sell his 85% shareholding to Green's consortium for £2 - another point contested by King - has stated that the CVA "is the best way forward for the club and it will leave Rangers in an excellent situation". Rangers entered administration in mid-February, nine months after Whyte acquired the majority shareholding from Sir David Murray. "My shares will form part of the consortium's shareholding and after that I will focus on other activities. "It has certainly been an eventful year but I did what needed to be done, unpopular as it was. There was no alternative. It had to be done. "If it wasn't me it would have been someone else. "People will look back in a year or two with a different view. People have conveniently forgotten the state Rangers were in at that time. "I should have taken the club into administration on completion of the deal. "But there was no way the situation would have been avoided unless someone came in and put in £100m and we have seen in recent weeks how difficult it is to get anyone to put money into a football club." Whyte is threatening to take legal action against the Scottish Football Association, who deemed the businessman unfit to hold an official position in the game when he was handed fines totalling £200,000 for bringing the game into disrepute. "I will be going after them," he said. "I will be looking at legal options against the SFA. "They have a lot to answer for with their defamatory statements about me which formed the basis of their so-called investigation. "Scottish football's regulators are inept and have showed themselves up. But they have no jurisdiction over me."